Ships of the Sea Maritime Museum’s inaugural opening occurred on “Georgia Day,” February 12, 1966. Most of the Museum’s exhibits consisted of items donated by its founder, Citizen’s and Southern National Bank President Mills B. Lane, Jr. Over a 15 year period, Lane accumulated a personal collection of more than 100 ship models and a vast assortment of nautical “flotsam and jetsam.” Lane began his collection in 1950 when he commissioned a former sea captain and local celebrity ship modeler to construct a replica of the SS Savannah. The model builder was Captain Joseph Gallettini of Wilmington Island whose work graced Savannah’s City Hall and a former U.S. President’s retreat. 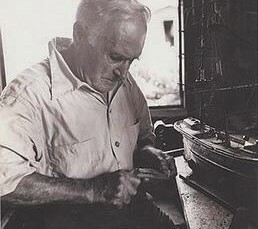 Captain Gallettini gained notoriety in 1932, when he carved a sailing ship from a cedar tree which had felled during a hurricane. He named it the Franklin Delano Roosevelt. The model was presented to a grateful president-elect who kept it at his “Little White House” in Warm Springs, GA. 30 years later, another president requested a model similar to the one made for FDR. Hence, Capt. Gallettini made an exact replica of the Roosevelt and named it the John F. Kennedy. This model, however, was never presented due to a series of ill-fated events which included the assassination of President Kennedy. After nearly twenty years the model JFK will once again go on display at Ships of the Sea along with other Gallettini works created expressly for the Museum’s founder, banker Mills B. Lane, Jr.